Property 2: New!!! Tiny House Cabin Adventure on the River!!! Wifi and Firepit/free wood!!! Cozy, Secluded Log Cabin! 3600' Elevation! Spectacular mountain view! Property 3: Cozy, Secluded Log Cabin! 3600' Elevation! Spectacular mountain view! Property 6: Stay in the Heart of Dillsboro! Property 9: LUXURY LOG CABIN - BRAND NEW 2018 HOT TUB, GAME ROOM, WIFI, FIRE PIT, VIEWS! Property 13: A-FRAME LOG CABIN IN THE WOODS! -WIFI, HOT TUB, CREEK, VIEWS, FIRE PIT! Enjoy 30 Mile Long Range Views & Game Room With Pool Table. Near Dillsboro! Property 19: Enjoy 30 Mile Long Range Views & Game Room With Pool Table. Near Dillsboro! Property 20: Bold Rushing Creek With Private Island! Beautiful Smoky Mountain Home 2/2 BB Amazing View! 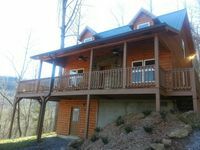 Property 22: Beautiful Smoky Mountain Home 2/2 BB Amazing View! Quaint Mountain Cabin with Long Range Mountain Views - Hot Tub! Fire Pit! Convenient Location! Property 25: Quaint Mountain Cabin with Long Range Mountain Views - Hot Tub! Fire Pit! Convenient Location! Welcome to Eagle's View Lodge! Big Views, Wi-Fi, Hot Tub, Fire Pit & More! Property 26: Welcome to Eagle's View Lodge! Big Views, Wi-Fi, Hot Tub, Fire Pit & More! Amazing Views, Hot Tub, King Bed, and free Wi-Fi. 5 Star Reviews! Property 27: Amazing Views, Hot Tub, King Bed, and free Wi-Fi. 5 Star Reviews! Amazing Spacious Mountain Home! Great Central Location! Property 28: Amazing Spacious Mountain Home! Great Central Location! Creek Side Cabin: Great fishing just a short walk away. Property 32: Creek Side Cabin: Great fishing just a short walk away. Property 34: Charming Cabin with Long Range Views! Close to renoun state trout fishing streams! Property 35: NEW! Riverfront Cullowhee Home 5 Minutes to WCU! Property 39: Artist's home with a beautiful mountain view and convenient location. NORTH CAROLINA MOUNTAIN TOP CABIN WITH PORCH .COME ENJOY THE FALL COLORS . Property 40: NORTH CAROLINA MOUNTAIN TOP CABIN WITH PORCH .COME ENJOY THE FALL COLORS . Gorgeous River Front Custom Cabin: This cabin is a fishermans paradise! Property 41: Gorgeous River Front Custom Cabin: This cabin is a fishermans paradise! Simple Times Cabin on the Creek- Book your spring getaway now! Property 49: Simple Times Cabin on the Creek- Book your spring getaway now! Nice place. Home was very clean. Beds were very comfortable and enjoyed the hot tub. This is just the most perfect little cottage, it has everything you need and if by chance you want for anything the owner is very responsive and more than accomodating. Even though her home is on property and close by your privacy is very important to her. Rent this little jewel it is just the sweetest little cottage. 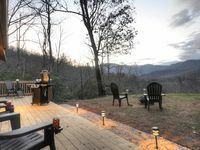 Great location as well for visiting the outlying areas such as Asheville, the Blue Ridge Parkway, and many other areas. We hope to return in the near future.